An African proverb that I think of often says, “If you want to go quickly, go alone. If you want to go far, go together.” I used to think it was an indictment of the solitary runner who wanted to go quickly until I realized that speed and distance are morally neutral objectives. There are times when we need to go fast and there are times when we need to go far. Some people need to do each more often than the other. Not a wise type personally, I rarely—or more precisely, never—think about proverbs myself. But they (particularly the “African” kind) come up often enough in personal writing that I’ve developed a curiosity about their geneses. Even our contemporary ones (“never tweet,” etc) are born out of quite specific scenarios, and this one, being attributed non-extemporaneously to “Africa,” intrigued me. In a continent that stretches over 11 million square miles and holds over a billion proverb-generators, which particular structure of labor and leisure and social organization gave rise to this pithy little saying? “If you want to go quickly, go alone. If you want to go far, go together.” ~African proverb. Here’s a sampling of what I mean. There’s an old African proverb that says “If you want to go quickly, go alone. If you want to go far, go together.” We have to go far — quickly. And that means we have to quickly find a way to change the world’s consciousness about exactly what we’re facing, and why we have to work to solve it. You know, there’s an old African proverb that I made up. “If you want to go quickly, go alone. 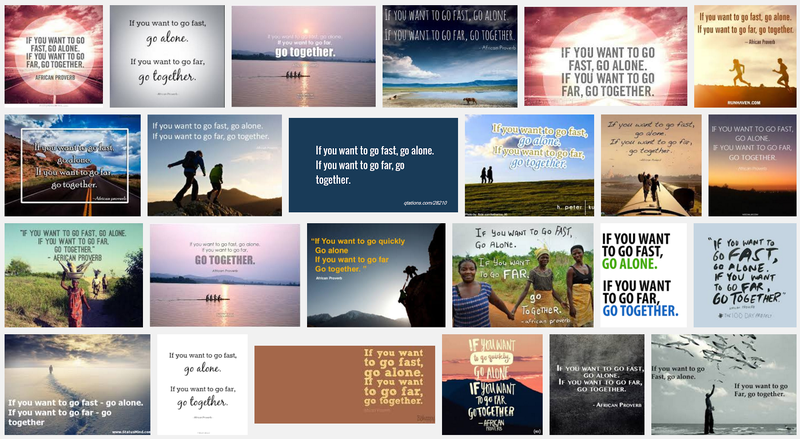 If you want to go far, go together.” We need to go far, quickly. The quote appears in an LA Times story about the Westlake basketball team. It is a pull-quote on the corporate responsibility page of TOMS. It’s in a book about “teaching entrepreneurship to postgraduates.” It is identified as “Kenyan” in a book called Glorious & Free; it is identified as a saying of “Botswanan grandmothers” in a novel by Jodi Picoult. It is the quote of the day on the Facebook page of a Portland bakery called Pip’s Original Doughnuts. And on and on and on. In my passing experience, the “~African Proverb” type of wisdom—extremely general, with a veneer of authenticity borrowed from the continent where human life originated—seems particularly popular among tech types, NGO types, techy NGO types, Ted Talks and evangelical Christians; this rough gesture is frequently made on Instagram and Pinterest, as well.